On an afternoon in Split, Croatia in the spring, we decided to take a walk. We started at the ferry port—that teeming hallmark of so many Mediterranean cities—and moved southeast along the shore without a map or an agenda. It was warm for April, one of those days where you’re not sure how to dress out of fear that the weather will make a soggy or a sweltering fool of you. On this day, it was more swelter than anything else, the sky incomprehensibly blue. To walk that shore is to see Croatia at her prettiest and her ugliest, all at once. The ragged white cliffs along the coast plunge dramatically into the sea. The water is, as promised, that sublime Mediterranean blue. But really, it was the people that made this strip of coastline so lovely and alive. Families crammed into the seaside restaurants. Children giggled madly as they bounded into the water. Twentysomethings walked their dogs. We saw the Dalmatian coast on parade, the same way Central Park in summer is both a place to relax and a place to watch the city happen before your eyes. It was urban theater at its finest. By the time we sat in one of those tangling little seaside cafes, about an hour’s walk from the ferry port, we felt as though we’d passed through the belly of Croatian coastal life. And maybe we hadn’t. It’s so easy to make pronouncements about discovering an “authentic” place, when in reality, as travelers, we usually just don’t know. But this felt good, whatever it was, this swarm of people in sunglasses enjoying the day. Still, though, there was something that we couldn’t ignore. 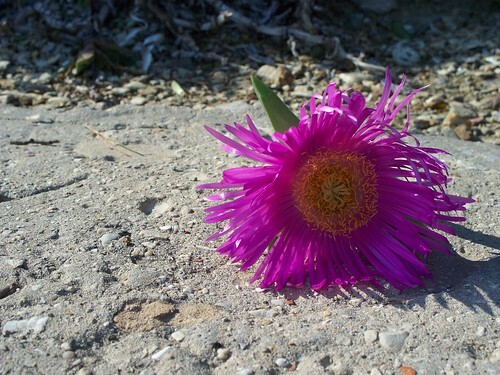 Amidst so much natural beauty—at one point, the hills that drop into the sea are covered in swaths of pink wildflowers—were hints of things distinctly man-made. The walking path along the water has been paved over, giving it the air of a town swimming pool. At the edge, the concrete is shattered, crumbling inevitably into the sea. The hotels that dot this stretch are lumbering and plain and painted in industrial yellows and blues. A seaside playground is full of hard metal slides and seesaws. There is no picturesque boardwalk in Split, no made-for-tourists vista to take photos or a luxury hotel with an Italian name. Not in this part, anyway. Instead it was just us in a cafe, watching people gossip and pat their impeccable little dogs, and smoke, and drink their coffee, and do everything else that an easy afternoon on the coast affords. To reach the strip of coastline just southeast of Split, take a left at the ferry port and keep walking for about an hour. A drink in a cafe will set you back about 8 kuna. It’s worth it. When a city has nothing to attract tourists but its beauty, its back roads and cafes, it will ask that you do what its citizens have been doing since wooden-wheeled carts were the preferred method of transport. It will recommend that you climb its bell tower. Or its triumphal arch. Or its highest peak. Or to a little park that sits on a cliff. Or what little remains of its once-glorious ramparts. Or the lantern of its cathedral. Climbing stuff is the classic tourist activity. Google Maps has taken away some of the joy, perhaps, has made it a little harder to fork over your 15 kuna to the guy at the ticket table. (“I can look this up at home,” you think, a little more begrudging each time.) But you do it, maybe to say you did it and maybe because you know that the climbing of a bell tower—all 400 steps; they usually tell you how many on a placard somewhere—has created an economy in a town where there were once only farmers, soldiers, and a single nobleman who spent most of the year at his vacation castle on the coast. 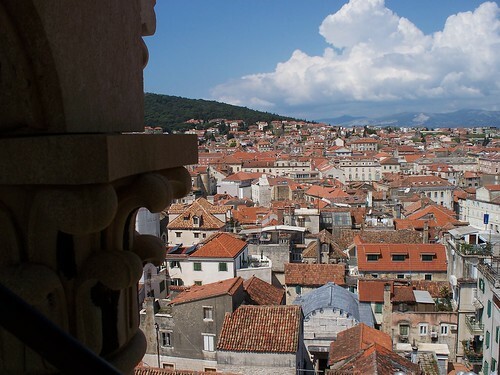 In Split, Croatia, the bell tower of St. Duje rises up out of the city center, poking a hole through and rising high above a patchwork of red tile roofs. It is connected to the cathedral, of course, but this cathedral began its life as the tomb of the emperor Diocletian, became a Christian church, and then ended up as a tourist trap. Such is the cycle for many structures in Europe. I wanted to climb it because I always climb things, because I am one of those people who still likes a good vista view. And because sometimes, the view sparks something. A memory of somewhere else. A somber meditation on the smallness and preciousness of us all. The thoughts and feelings that, centuries earlier, were only experienced by a lone bell ringer, a poorly-paid caretaker, or an abbot. And sometimes the view sparks something else. The climb to the top of the bell tower at St. Duje requires that you navigate two flights of steep stone steps on the bottom levels that give way to the basically hollow tower. From there, the only thing supporting you is a rickety iron staircase that coils to the top. The tower is perforated on every side by tall windows without glass, and you can see the open space between each step. The Arc de Triomphe cradles you on the way up in dark, closed stairways, so the height is imperceptible until you reach the top. You are whisked halfway up St. Peter’s in an elevator. Other climbs offer stern warnings in four languages, railings with comfort grips. But this? My friend Ola stops after the second set of stairs. We have reached the bells, a fat half-dozen of them rigged up on posts, wheels, and wires. “I think I’m going to wait here,” she says. I am not afraid of heights. One of my favorite places on earth is the plain but peaceful cafe at the top of the Tour Montparnasse with its streaming sun, its best-in-the-city view of the Eiffel Tower. But I have a creeping issue or two with open spaces, and I’ve known it since I was a teenager. I was in the front row of the top balcony at Radio City Music Hall and I intermittently felt like I was dying for the better part of three hours while the Rockettes high-kicked away. The view at the top is breathtaking, the red patches of roof against the blue Adriatic against the green offshore islands against the white stone city walls. It reels around me in a blur. I tip my head up once to see the beams in the lantern, just once, and its weirdly grounding. There is a roof. You will not fly off the surface. You will not fall into the abyss. The roof will stop you. I snap a few pictures, hoping that my camera will remember what my brain won’t. I descend, quickly, one foot in front of the other. By the time I reach the pavement below, Ola smiling and I’m shaking like a leaf. And maybe it’s a lesson, the things that cities whisper to you when you’ve gotten too smart, ascended too many stairs. Just because you can look it up doesn’t mean it’s ordinary. Others have gone before you, have paid the price of admission, but your terror could be wholly new, wholly different. And you never know until to you climb.